Momma of Two Review: Squeaky Clean Pups Are The BEST! Squeaky Clean Pups Are The BEST! There is nothing more disappointing than walking into a home and knowing that the house inhabits animals just by the way it smells. I take great strides to ensure that our animals live with us without making their scent known to the world. One thing that helps is (shocker here folks): bathing them. This becomes quite a task when the dog you own is almost 100 pounds, but hey, at least he is cute! 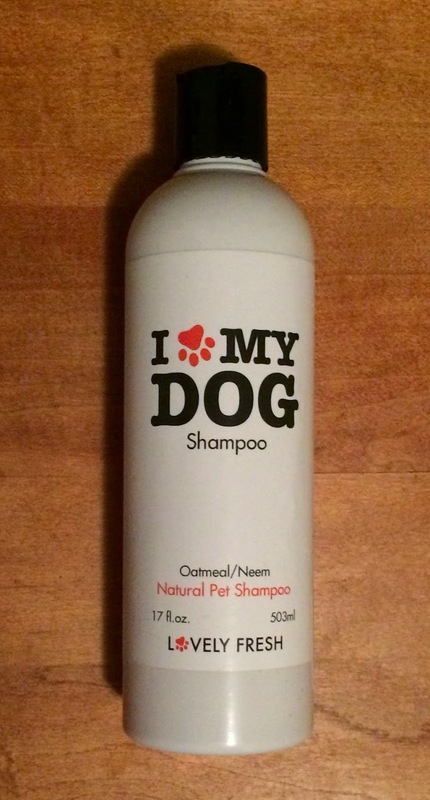 I had the opportunity to try out a new-to-me dog shampoo (on my dog of course! ), and it's amazing! It is called I Love My Dog, Dog Shampoo by Lovely Fresh. I prepared myself pretty well when we decided we were going to get a puppy. I wanted a big breed, a family dog and something with short hair. If it is going to shed, I need it to be dark and short. So, of course, we got a black labrador retriever. You know what information I must have bypassed throughout my research? The fact that these dogs have the worst skin issues EVER. My dog itches his head off in the Summer from who knows what, and then suffers dry skin all Winter long.... It turns into a vicious cycle because the itching leads to scabs which leads to more itching and more scabs, and so on and so forth. Washing can sometimes heighten the problem, so we have to be careful not to bathe the pup too much. One thing I noticed about the I Love My Dog, Dog Shampoo, is that it works well at drying out his skin after bathing. The first thing I noticed about this shampoo was that it smells soooooo good. Most dog shampoos smell strange or indifferent, but this one really smells good. Like sweet candy. And who doesn't want their dog to smell absolutely divine? On top of that, the ingredients, including oatmeal and neem oil are formulated to moisturize and soothe dry, itchy skin, while leaving them clean, fresh and relieved without the use of harsh soap. What is even more important is that this product will not reduce the efficiency of flea and tick preventative treatments. Right now you can purchase this item for $14.95 HERE - take note that this price is subject to change at any time. To keep up with Lovely Fresh and any new products (or promotions) they have for your four-legged family members you can check them out on their website, Facebook or Instagram!